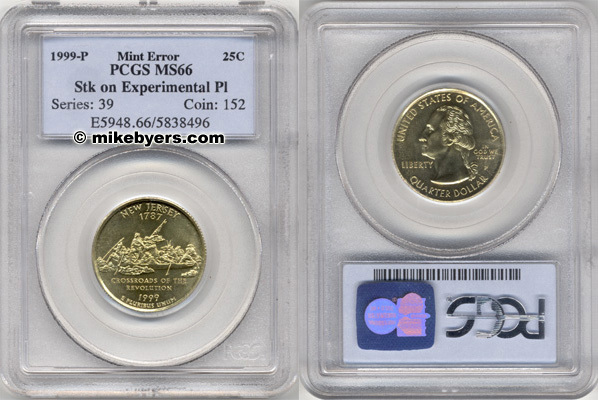 Click on each slab above to view enhanced photos. 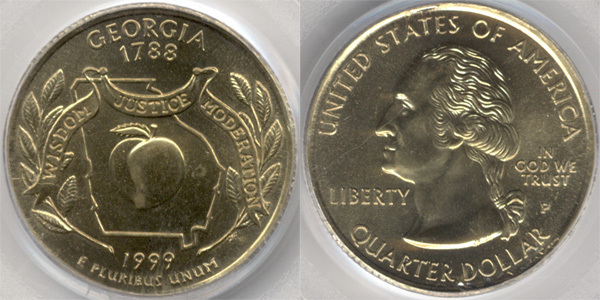 There are approximately 20 known 1999 State Quarters struck on Experimental Planchets. 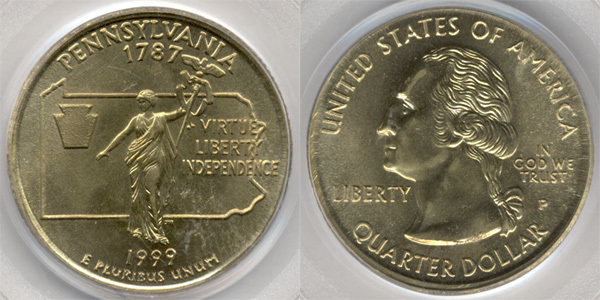 All five states in the 1999 series (DE, PA, CT, GA and NJ) have been discovered.These Experimental State Quarters have sold for as high as $15,000 each, depending on which state, the coin's condition and which type of experimental composition was used. 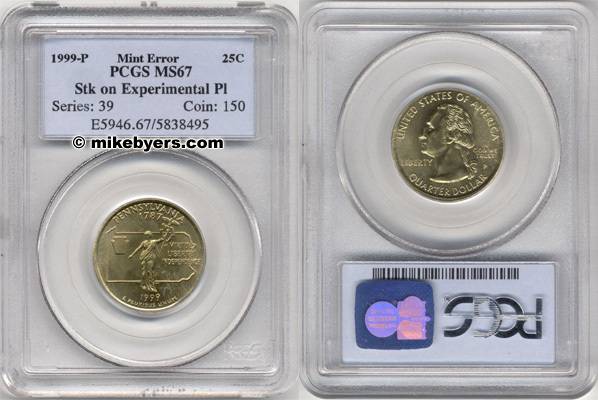 There are four known types of experimental compositions which have been discovered so far on 1999 State Quarters. 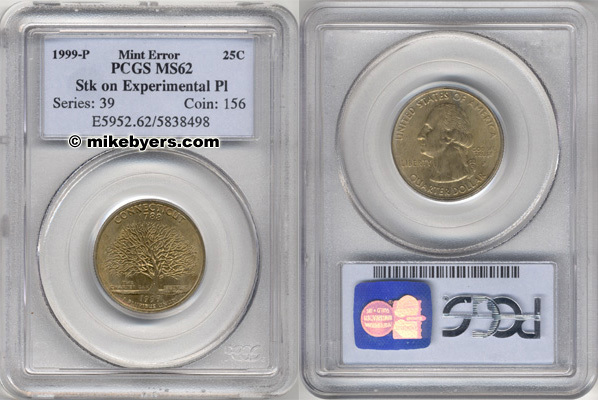 Type #1 - This type has the "color" of a Sacagawea Dollar and has the copper center core. 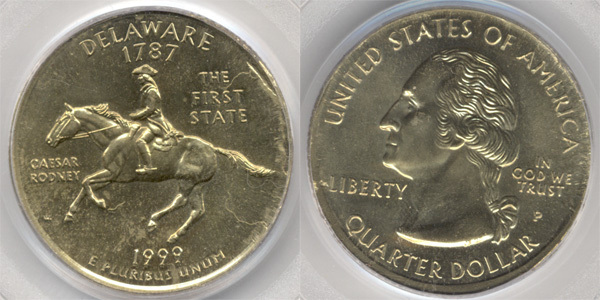 Type #2 - This type has the "color" of the Sacagawea Dollar but does not have the copper center core. Type #3 - This type has a slight "green" color and has the copper center core. Type #4 - This type has a slight "green" color but does not have the copper center core. WEIGHT - The weight on ALL of these discovered so far is OVERWEIGHT - varying from 5.9 grams to 6.3 grams. 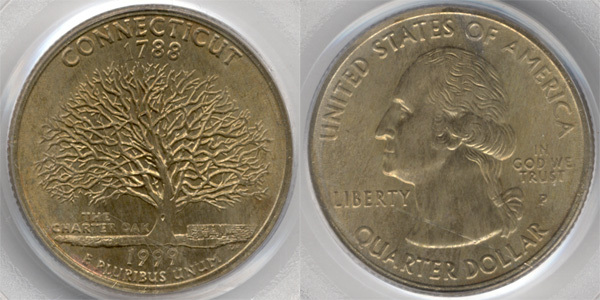 SIZE - It is slightly THICKER than a regular State Quarter, due to the heavier planchet. 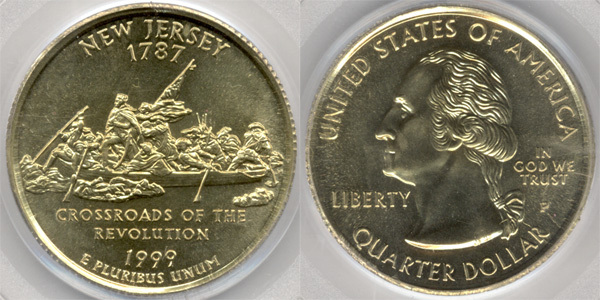 COLOR - So far, the pieces discovered are either the same "color" of the Sacagawea Dollar, or have a slight "green hue" to them. LOOK - The edge is slightly rough and may have a higher rim around part of the edge. EDGE - Some of these do NOT have the center COPPER CORE. STRIKE - None discovered so far are proof-like in the fields. REEDING - Some of these have incomplete reeding. 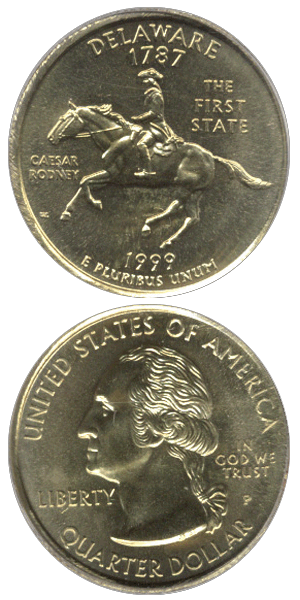 These coins were analyzed by spectroscopy (SEM-EDX) using electron microscopy and energy-dispersive x-rays to determine the alloy composition. The predominant metal is copper, followed by zinc. 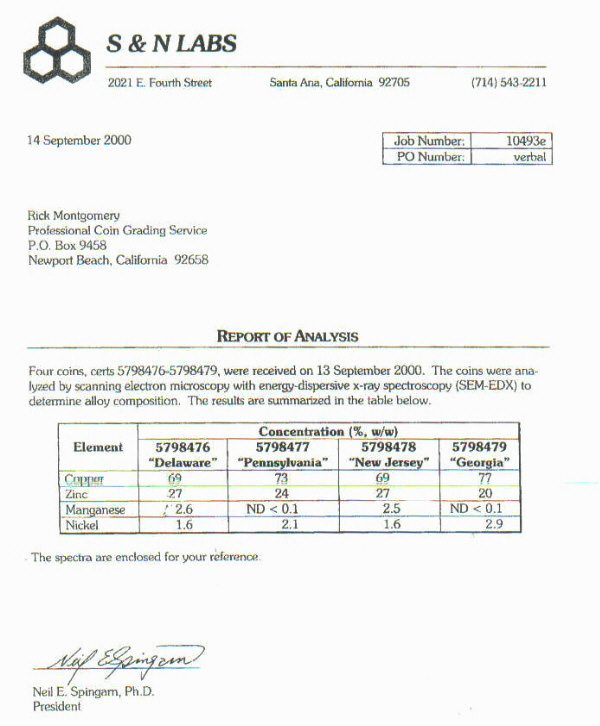 There are also small percentages of manganese and nickel. 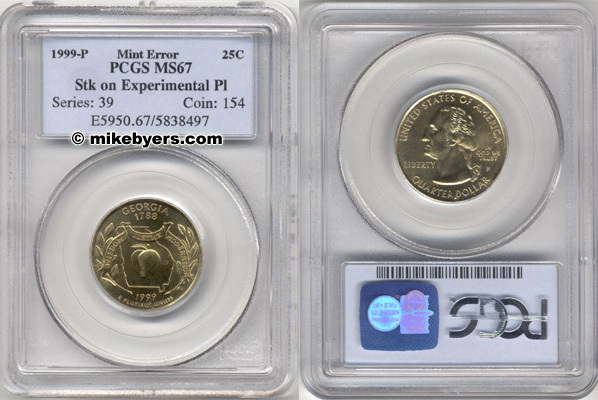 PCGS and NGC have both authenticated and certified these 1999 State Quarters as being struck on experimental planchets. 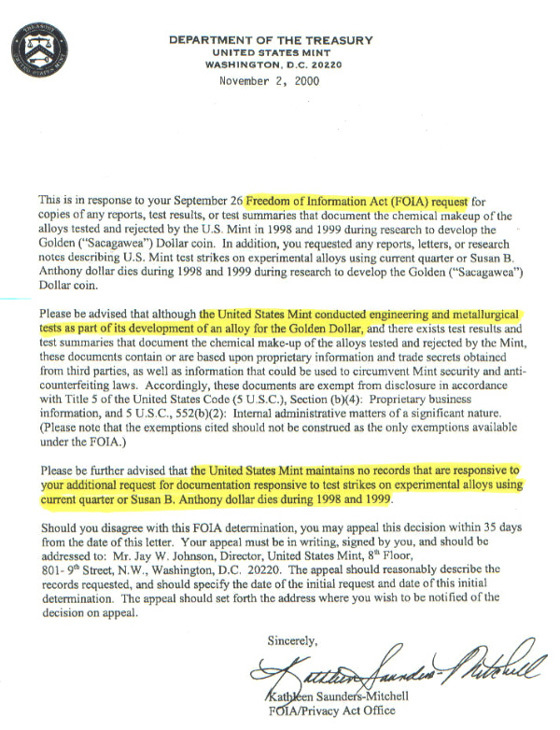 A Freedom of Information Act (FOIA) request for copies of any reports and test results was submitted to the Department of the Treasury. 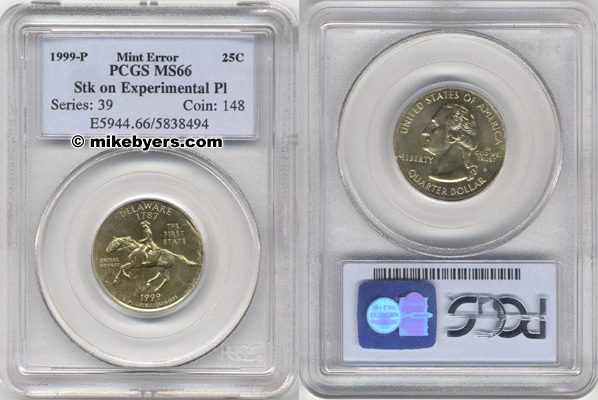 They acknowledged that the U.S. Mint conducted engineering and metallurgical tests as part of its development of an alloy for the Golden Dollar, but would not release any information.